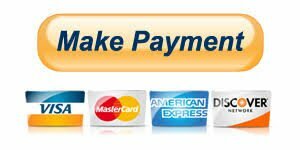 If you want to pay on your account online, simply click on the link below. Your browser will be redirected to a secure, encrypted PayPal site. You will then have the option of paying with any major credit card. If you have a PayPal account you may also pay via PayPal if you prefer. Once you make a payment you will automatically be sent an email receipt confirming your payment.